Middle ear infection symptoms vary from person to person. Some may experience high fever, irritability and mood swings, while others may not have a fever at all. What is important to understand the causes for middle ear infection symptoms and how to treat them effectively. The ear is split into three separate areas – outer, middle and inner ear. Ear infection symptoms appear when an Eustachian tube blockage occurs. This prevents the middle ear fluid from draining properly; bacteria build up and causes an infection called a middle ear infection. Inner ear infections affect your body differently because the symptoms are felt deeper within your core. Instead of placing focus on the middle ear and the Eustachian tube, the inner ear relies on two canals, called labyrinths to send messages to your brain; the messages affect sound and movement. Middle ear infection symptoms do not include vertigo or loss of balance. An inner ear infection can be a signal that something much more serious is happening that may affect your hearing and even brain. 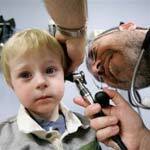 Ear pain – Young children will often cry more than usual. They will also rub and pull at the infected ear. Lack of appetite – Changes in pressure can cause pain so simple acts like, chewing and swallowing are avoided. Changes in sleeping patterns – Lying down can cause a shift within the middle ear and sleeping can become interrupted. Hearing difficulties – Too much fluid can build up within the middle ear and cause hearing loss. This can be reversed if treated properly. Fever – Ear infections are the result of a virus or bacteria which also raises the body temperature. Diarrhea – Changes in eating habits can cause diarrhea. Also some bacteria can cause diarrhea as well. Hopefully, you have a better understanding of middle ear infection symptoms and the how they affect your body. Now you can use this information to act quickly if you see an ear infection developing. The best course of treatment should be swift and effective. If you enjoyed reading this article, please take a look at other article talking about role of antibiotics for ear infections.